Facebook's plan to create an archive of ads about political issues that could include news articles "dangerously blurs the lines between real reporting and propaganda," a group representing some of the news industry said in a letter to the social media company on Friday. 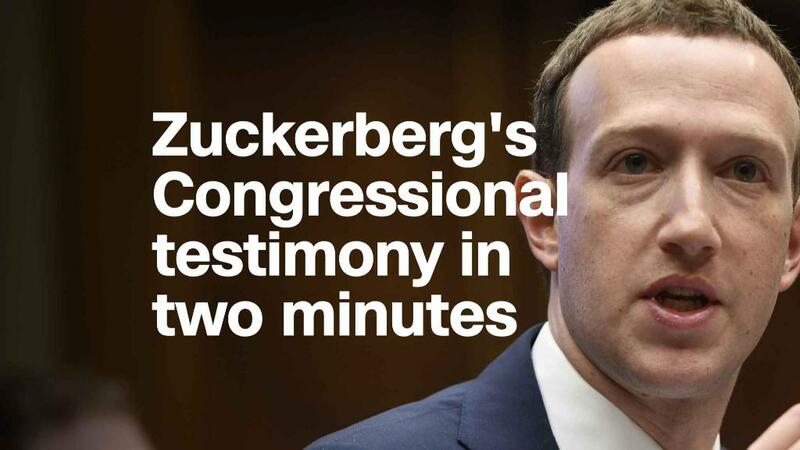 Facebook is due to begin rolling out new efforts to increase transparency about political advertising on the platform in the coming weeks. The move comes after it emerged that a group tied to the Russian government had bought ads on the platform ahead of the 2016 US presidential election. Facebook says it will require political ad buyers to verify they are a citizen or permanent resident in the US. In addition, political ads will have a label showing who paid for them and all applicable ads will be available to view in a searchable archive. The company's new policy doesn't only apply to ads advocating for or against a particular candidate, however. Any ads that mention a candidate will be subject to the policy. In addition, the company recently published a list of twenty "top-level issues" it said would be "considered to require advertiser authorization and labeling for ads targeting the US." The list includes a broad swath of issues including, abortion, civil rights, crime, economy, education, environment, foreign policy, guns, health, immigration, military, poverty, taxes, terrorism, and "values." Some news publishers use Facebook ads to promote their news articles. On Thursday, CNN reviewed the active Facebook ad campaigns of more than a dozen American and international news outlets popular on the social networking site. 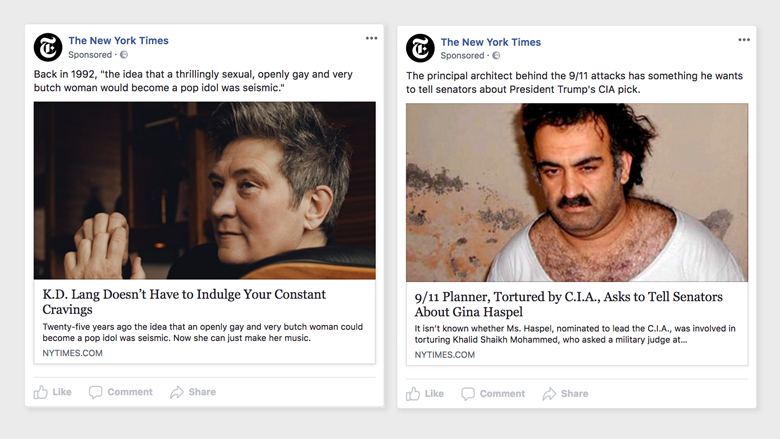 Only The New York Times and online video publisher NowThis News were running ads on Thursday, according to Facebook's "view ads" feature — a tool the company is trialing in Ireland and Canada, and allows users to see what pages are running ads. CNN sent Facebook a selection of the ads to ask what the company would deem political. "The principal architect behind the 9/11 attacks has something he wants to tell senators about President Trump's CIA pick," the text of one ad run by The New York Times read. It linked to a story headlined "9/11 Planner, Tortured by C.I.A., Asks to Tell Senators About Gina Haspel." Meaning, the ad would include details about who paid for the ad, and be included in the political ad archive. Another ad run by The New York Times included the text, "Back in 1992, 'the idea that a thrilling sexual, openly gay and very butch woman would become a pop idol was seismic," and linked to an article headlined "K.D. Lang Doesn't Have to Indulge Your Constant Cravings." Facebook said ads about civil rights will be subject to its stricter rules but the company told CNN, this particular ad "would not be deemed political or issue content as it focuses on the journey of an individual rather than a civil rights discussion." Facebook's new ad rules not only apply to political campaigns and news publishers, but to anyone who wants to place an ad on the platform the company deems political. Meaning, ads by popular brands that touch on political issues could also be subject to the new rules. Facebook has not suggested any pages will be exempt from its new rules. Exempting certain news outlets could put the company in a difficult position determining what does and does not constitute a "news outlet." In its letter to the social media company on Friday, the News Media Alliance, a trade group representing more than 2,000 news organizations in the US, including The New York Times and the Wall Street Journal, suggested that Facebook could "exempt news in the ad archive and labelling process for political content." "Newsgathering and reporting about politics is not the same thing as advocacy or politics," the letter read. CNN is not part of the News Media Alliance. In response to the letter, Campbell Brown, Facebook's Head of News Partnerships, said in a statement that preventing misinformation and election interference was one of the company's top priorities. "We recognize the news content about politics is different and we are working with publishers to develop the right approach," the statement added.